Drizzle extra virgin olive oil generously over the chicken (both sides) and rub with fresh sage and garlic. Season well with salt and black pepper. Make a slit in the side of each chop. Stuff each chicken breast with stuffing. Heat a tablespoon of olive oil in a large skillet and sear pork chops on both sides until browned (3 to 4 minutes). Transfer pork chops to a large greased baking dish. Glazed the top of each chicken breast with maple syrup. Bake uncovered for 15 to 20 minutes or until cooked. Glaze chops throughout cooking time. Turn chops over halfway and continue glazing until all the maple syrup is used up. You can also use pan drippings to glaze the chicken breast because that's where all the great flavor is and color. Remove from heat and allow to rest before serving. 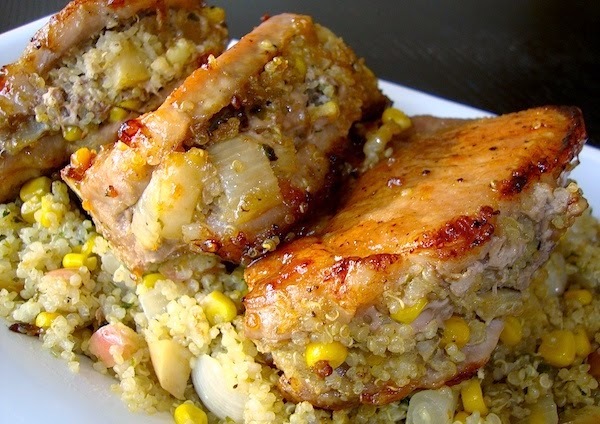 In a large serving platter, cover the bottom with stuffing and arrange chicken breast on top. Glaze the chicken with pan drippings and garnish with fresh sage or herbs of your choice.